In the last days of the Soviet Union, Belarus was the most russified of all its republics, and there were few supporters of national revival in its Communist leadership or bureaucratic apparatus. A small nationalist tendency was nevertheless represented in the new republic’s government, and its members managed to introduce some appropriate reforms. In 1990, Belarusian became the country’s only official language; the flag and coat of arms of the Belarusian People’s Republic (declared in 1918) were re-adopted for the new post-Soviet republic and a programme of ‘belarusification’ was set in motion in the spheres of education and cultural life. But this policy did not last for very long. 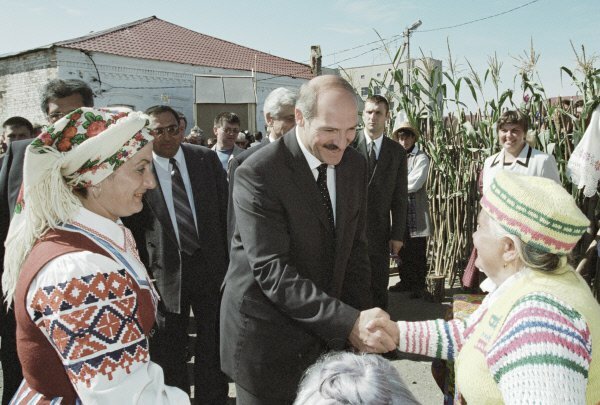 In 1994, Alyaksandr Lukashenka was elected as the country’s first president and he looked to Russia and a renewal of the close economic links of the Soviet period as a way to pull Belarus out of its critical economic situation. In the 1990s, Russo-centrism became official ideology – the idea being that Belarus would be reunited with Russia and Ukraine as a great Slav people. In 1996, after a referendum, Russian became an official language and an adapted version of the Soviet-era flag and coat of arms was reinstated. History textbooks were rewritten to show Belarus as part of a Russian, not European, civilisation, and the number of Belarusian language schools and media platforms declined sharply, while economic and military ties with Russia were strengthened by a treaty uniting the two countries in a Union State. In 1996 Russian became an official language and an adapted Soviet-era flag and coat of arms reinstated. In the early 2000s, however, with a new Russian government in power and with a well-established Belarusian elite in place with its own interests, the Lukashenka government decided to replace its pro-Russian position with a so-called Belarusian State ideology. Central to this ideology was the concept of Belarus as a territorial – and not a historical or cultural-linguistic – entity. This new direction was designed to validate the government’s economic and political agenda, and to boost the public’s loyalty towards it. Language and culture were of little relevance here, or so it seemed. But over the last 20 years, this ideology has left its mark on Belarusian language and culture. Formal equality between Belarusian and Russian no long exists, with Russian language dominating all aspects of life. Russian is used almost universally in education, as well as in about 90% of media outlets, most of which are in Russian anyway. In the past, the average Belarusian has shown little resistance to this process of russificiation. The local population was never particularly interested in national values, and Belarus had the weakest national identity of all its neighbours. People were even quite enthusiastic about Lukashenka’s russification policy as it meant they could continue to access Russian language media and a Soviet culture, which they had become accustomed to. This situation seemed to satisfy everyone, apart from a few intellectuals and civic activists who were powerless to change anything in this authoritarian state. But the crisis, which erupted in Ukraine in 2014, and the political problems it brought with it, triggered a sharp change in the Belarusian government’s attitude to its country’s national identity. When Russia used ethnic affiliation and common language as a justification for invading Ukrainian territory, the Lukashenka government, fearful that the same fate might befall Belarus, began to look closely at the consequences of its own russification policy; a policy that had been reinforced by Russian TV propaganda, which had allowed Russia apologists to come to dominate Belarusian politics. Before 2014, Lukashenka and other officials would say things like, ‘Our language question was settled once and for all in 1996. If you want to speak Belarusian, there’s no law against it.’ National identity was relegated to the margins of government policy. But now our ruling classes, including the president himself, have been making unprecedented declarations of support for Belarusian language and culture. These and other high profile statements reveal a sea change in the Belarusian elites’ attitude to national identity. Today’s political elites are keen to see their country as an independent state. The only strong ideological alternative to Putin’s ‘Russian World’ idea is the nationalism promoted two decades ago by Belarus’s opposition. It turns out that this nationalism is a viable concept after all, and the government in Minsk has decided to incorporate it into its own ideology. But the rhetoric has so far failed to produce any real sustainable action. The government’s caution is understandable – it’s dangerous to anger Moscow with openly anti-Russian measures. Belarusian officials are determined to change identity policy in a rational, evolutionary manner. Right now, however, it is still unclear how deep and sustainable the changes might be and whether or not Russia will put political or economic pressure on Belarus in an attempt to impede the process. So far, the only people worried about the U-turn are Russian ultranationalist groups, who have christened the new policy ‘de-russification’ and ‘the road to another Ukraine.’ The official Kremlin media are meanwhile remaining silent about the whole thing. Russia, given its current international isolation, needs an ally as never before, and so Belarus continues to trumpet its brotherhood with Russia, indulge in anti-Western rhetoric and accuse NATO of attempted destabilisation, all the while holding weekly meetings with US and EU representatives as part of a planned process of normalisation of their mutual relationships. Belarus’ foreign policy pendulum is thus swinging madly back and forth. Just before the start of the Ukrainian crisis and the emergence of Minsk’s newly found interest in a Belarusian national identity, various civil rights initiatives began to spring up throughout the country’s larger cities, which attempted to make Belarusian culture fashionable and to roll it out for mass consumption. These initiatives replaced the traditional strategy of confrontation when it became clear that Lukashenka was not going anywhere and that anti-government protests were an ineffective means of establishing a nation. Civil rights initiatives were designed to create a fashion for Belarusian culture. The activists got it right, and young urbanites lapped up the new product. Belarusian language courses attracted hundreds of students (many had only encountered the language at school) and tattoos and T-shirts emblazoned with national emblems became a common sight on the streets. The internet is, naturally, central to the spread of these trends, as is the new availability of independent loft spaces. Previously, all buildings were under state control, and organising public events was extremely difficult, but now the government appears happy with these initiatives – it turns out they have common interests. But many observers are sceptical, believing that this new superficial interest in national culture will fade away as soon as another new trend hits the streets. And it is true that this process is largely confined to Minsk and a few other cities – the further from the capital you go, the less you see it. But events in Ukraine have certainly stirred nationalist sentiments among various groups of young people. Belarusian football fans, for example, are adopting the Belarusian language and national emblems, and are taking a nationalist, anti-Russian stance to support their Ukrainian brothers. This growing fan movement, which is also absorbing existing protest subcultures, is increasingly drawing the attention of the security forces. The use of Belarusian and national culture in business has also been growing. Some companies see this as a social project; others find that a bit of local colour helps boost their profits. There are now billboards all over Minsk, which remind people to use Belarusian, and depict portraits of prominent historical figures. And the A-100 service station network uses only Belarusian when serving customers – the first private company to do so. It has seen its profits rise; many people buy their petrol there on principle. Major banks are also using Belarusian in their marketing campaigns and are financing initiatives aimed at reviving national culture. And international business has joined the trend, with firms such as Samsung and Adidas advertising in Belarusian. Only a few years ago businesses would never have risked this and the government would never have allowed it. Firms such as Samsung and Adidas are now advertising in Belarusian. But these trends have really only affected the upper echelons of Belarusian society. The rest of the population, who only use the internet for entertainment and watching Russian TV, are indifferent to belarusification. Still, it is clear that ordinary Belarusians’ attitude to their native language is becoming steadily more positive. If speaking Belarusian used to get you reviled as a nationalist, now most people, while not speaking the language, see it as something of value and are aware of their own heritage as distinct from those of neighbouring countries. This attitude is confirmed by research showing that Belarusians want to be independent of both Russia and Europe. Yet the population remains both broadly sympathetic to the Russian worldview as presented by the Kremlin, and sceptical of Europe. A recent survey revealed that pro-European sympathies were shared by only 25% of Belarusians, the lowest figure since 2007, while 60% described Russia’s annexation of Crimea as ‘historical justice’ and 42% believe that ‘Novorossiya’ should have the right to independence. The Belarusian government may be concerned about what they see as propaganda from the East, but they won’t run the risk of restricting access to Russian TV channels, nor are they keen to balance them with other information sources. Though they believe they have the situation under control, this tension between Belarusian and Russian sympathies could become a real problem in the future. It is still unclear how far Belarus’s rulers will take their new identity policy: they will obviously continue to cautiously look over their shoulders at Russia. But what is important is that for the first time politicians and activists of different hues seem to be on the same page as far as their country’s identity is concerned. And this offers hope for a more peaceful Belarusian future.